Winter is a popular time for people across the northern United States to travel south to Florida for a chance to escape the cold, and in January, visitors to the Sunshine State can leave their winter coats at home and enjoy the sun on one of the state's many beaches or attend some one-of-a-kind events. The first week of January will usually see average crowds at Central Florida's theme parks—attendance at Disney World is typically the least crowded from the second week of January through the first week in February, and the same holds for most other theme parks and attractions. Whether you're going to Universal Orlando or Disney World in January, it's important to know what to expect. Generally, Florida's daytime temperatures are easily tolerated by most visitors, but if you are visiting north Florida, you may need warmer clothing during the day and something more substantial than a sweater at night. Florida's mild climate extends into the winter months, but there is a chance for cold temperatures and even frost during the month in North and Central Florida. One plus for a January visit is that hurricane season doesn't begin until June 1 and frequent cold fronts that roll through the state seldom produces violent weather. The water temperature for the Gulf of Mexico (West Coast) ranges from above 50 degrees Fahrenheit to the high 60s. The Atlantic Ocean's (East Coast) waters average mid-to-high 50s from Central Florida north. The beaches to the south—West Palm Beach, Miami, and the Florida Keys—are always several degrees warmer than those in North Florida. You may want to opt for long sleeves, pants, and a light to heavy jacket for evenings, but otherwise, resort casual wear or beachwear is appropriate, which includes shorts if you tolerate cool to cold temperatures well. If you're visiting a theme park, don't forget comfortable shoes for the many miles you'll be walking. Additionally, sunscreen is a year-round necessity in Florida. Even in the dead of Florida's "winter," the sun can be intense enough to burn. Plus, even if the water is too cold to go for a swim, it's usually still warm enough to sunbathe. Even after the holidays are over, the celebrations continue in Florida's warm winter sun. 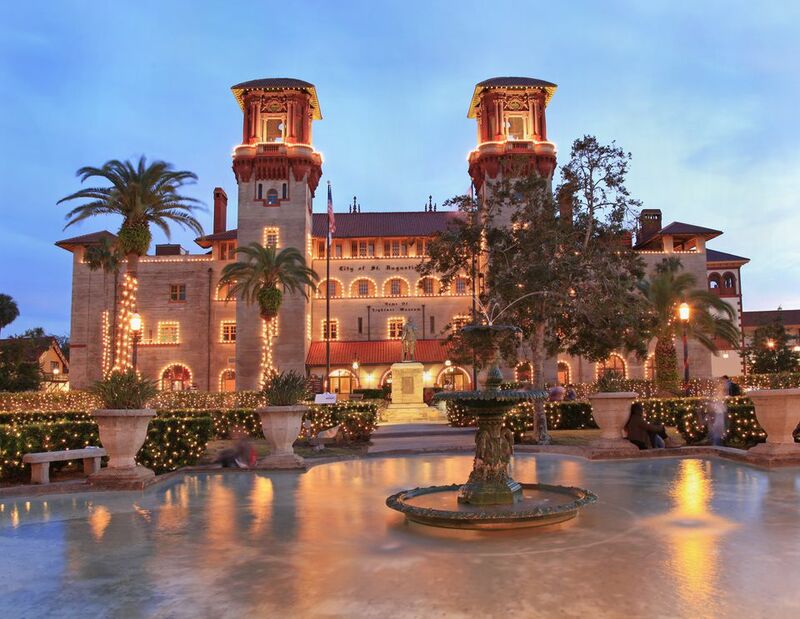 The Nights of Lights festival: If you're visiting northeast Florida in the early part of the month and still in the holiday spirit, consider heading over to the oldest city in America, St. Augustine, where millions of holiday lights illuminate the entire downtown area. The festival runs from late November through February and features over 2 million lights that illuminate the colonial buildings, downtown parks, and historic bayfront as well as a series of special events that will keep visitors busy well into the new year. Gasparilla Pirate Festival: This festival has, for a century, sailed into downtown Tampa. Hundreds of colorfully costumed pirates will "invade" the city aboard the Jose Gasparilla with canons and pistols blazing, accompanied by a flotilla of hundreds of boats. Later, Jose Gaspar and the Mystic Krewe captures (with little resistance) the city and shares the wealth of trinkets and doubloons with the enthusiastic crowd along the Parade route, making for a fun-filled day that might make you think you're in one of Disney's "Pirates of the Carribean" films. South Florida Fairgrounds: The West Palm Beach venue is, in January, home of the county's annual fair. The event includes more than 200 rides, livestock shows, traditional fair food, and more. 30A Songwriters Festival: Held each year in mid-January, this event includes more than 175 different artists and over 200 performances. Performers across all genres—folk, country, blues, Americana, and more—attend. Art Deco Weekend: Each year, Miami Beach celebrates its abundant Art Deco architecture with events that include parades, street food, live music, and more. January is a great time visit Disney World or the state's other theme parks. Attendance is typically lower as most kids are back in school after the holiday season. Florida's mild climate continues throughout the winter months. However, there is a chance for cold temperatures—even frost—during January in both northern and central Florida. So, if you plan on enjoying the famous white sand beaches, you may want to plan your trip later in the month.